Michael de Mesa (center) is glammed up as EdnaTurnblad in Atlantis Productions' Hairspray. This musical play is beingstaged at the Star Theater of Star City until December 7, 2008. As soon as audience members step into the Star Theater ofStar City, they are transported back to the swinging sixties—a time whenliberal attitudes were prevalent in society. It's also a time when bright colors were in, hemlines were high, and ladies' hairstyles went even higher. In the opening scene of Atlantis Productions' Hairspray,viewers are introduced to Tracy Turnblad (played by Madel Ching). The "pleasantlyplump" girl is a bundle of energy and her performance level is impressivethroughout the play. Mind you, performing energetic song-and-dance numbers fortwo hours is not an easy feat. Madel did a good job of building her staminaeven towards the end of the play when she led the cast in singing "You Can'tStop the Beat." It seems like there is really no stopping this young girl fromconquering the theater scene. There was once instance when you just want to tone downMadel's acting, particularly the scene where she is paired with Link Larkin fora song number that ends with a big kiss. She was practically drooling over him,which is not a very pretty sight. It is interesting to note that this play from AtlantisProductions marks the beginning of the professional career of a young girl andmay well be the final appearance of a veteran actor. Madel is a junior atAteneo de Manila majoring in AB Political Science while Michael de Mesa hasbeen in the entertainment industry since the 1970s. Reports say that Michael plans to quit showbiz and work as amarketing executive for an ambulance company in the United States. This is justone of the many reasons why theatergoers should not miss watching Hairspray,which is being staged until December 7. 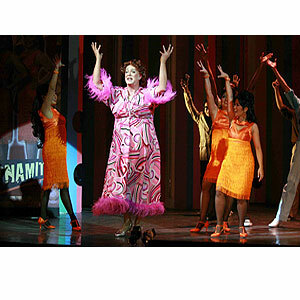 In keeping with the tradition of having a male perform therole of Edna Turnblad, Tracy's mother, Michael transforms into a fabulousfashion diva complete with a curly haired wig, elegant dresses, and high heels. When Michael drops his feminine Edna voice and turns into a lion (instead of alioness defending her baby), it's simply entertaining. Truly, he will be dearlymissed! The transformation is so complete that even his own soncould not believe that it was his father performing on stage. During thespecial preview of Hairspray last November 13, PEP (PhilippineEntertainment Portal) was able to ask Ryan Eigenmann regarding his father'sperformance. "I didn't see Michael-I saw Rosemary Gil, my grandmother! I don'tthink it was intentional but I saw some similarities in their mannerisms," hepoints out. Even though this is her first professional stage play, Madelproved that she could keep up with theater luminaries such as Michael, MenchuLauchengco-Yulo (as Velma Von Tussle), Dulce (as Motormouth Maybelle), LeoRialp (as Wilbur Turnblad), and Enchang Kaimo (as Female Authority Figure). Causing conflict in the story is Velma, which is played tothe hilt by Ms. Menchu. With her blond hair and perfectly manicuredfingernails, she is the most glamorous villainess this side of town. Hercharacter Velma doesn't quite elicit fear but she sure gives show-stoppingnumbers. Nyoy Volante wowed this writer during the play's rehearsalsand during the actual performance, he certainly proved that he has the groove.Dulce also stood out for her outstanding vocals and her noteworthy advice for the protagonists. For ticket inquiries, call Atlantis Productions at 892-7078or Ticketworld at 891-9999. November 28 (Friday) 8 p.m.
November 29 (Saturday) 2 p.m. and 8 p.m.
November 30 (Sunday) 3 p.m. and 8 p.m.
December 5 (Friday) 8 p.m.
December 6 (Saturday) 2 p.m. and 8 p.m.
December 7 (Sunday) 3 p.m. and 8 p.m.